We set about to make the best Thai basil fried rice. Knowing that a dish is only as good as the individual ingredients, we wanted to used the best Asian sauces and the freshest ingredients. We have tried a lot of Asian sauces, and there is definitely a difference between the brands – and these are some of our favorites. Jasmine rice, fried on a wok using a Big Kahuna outdoor burner. The outdoor burner has a much higher temperature and allows the rice to get that authentic wok fried flavor. The rice was dried overnight and then fried using peanut oil with a sauce made of Lee Kum Kee premium oyster sauce, Kwong Hung Seng thin soy sauce, Three crabs fish sauce, Panthai chili paste with soya bean oil (Nam Prik Pao), and organic sugar. Then yellow onion, red bell pepper, thai basil, carrots, green onion, jalapeno, was fried separately and mixed with the rice. The Chicken was dry brined with Tom Douglas’s chicken “rub-with-love”, then cooked indirectly on the Weber grill and smoked with cherry wood. 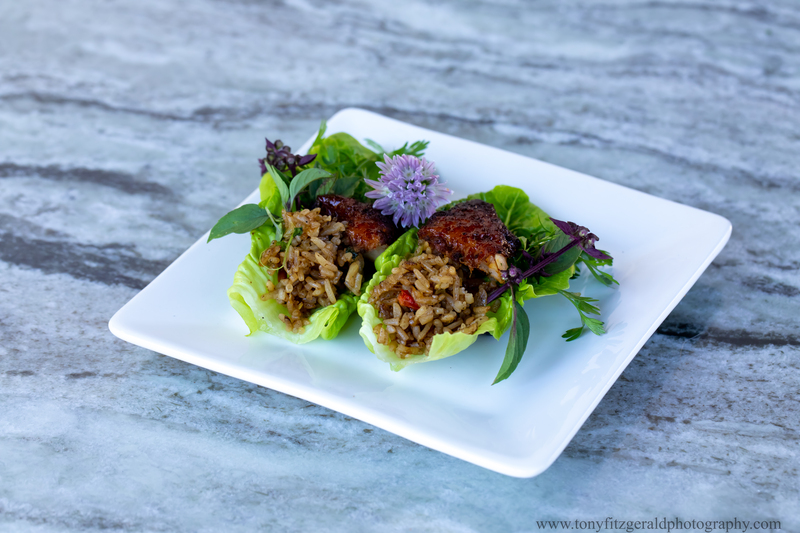 Served on baby romaine lettuce with thai basil, cilantro leaves and garlic flower from our garden.